We automaticaaly center your text, if you'd like a different alignment just let us know in the comments section. A truly huge mug, our engraved Super Mug commands attention! This personalized beer mug features a thick, long handle with a patterned thumb rest and a beveled bottom that resemble arches. It is 8 inches tall and holds 1 liter (33.8 ounces). 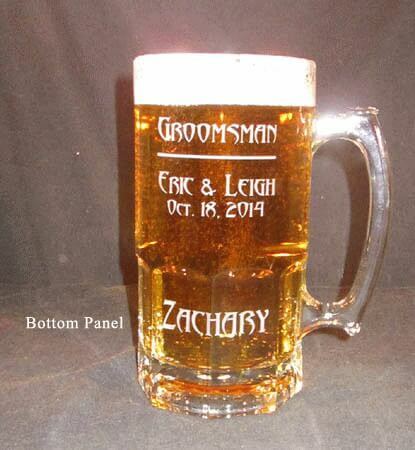 Personalization, text and/or design, on the front top panel of the custom beer mug is free, other options, such as the bottom panel and reverse side are available for an additional fee. We suggest keeping your text to 4 lines of 20 characters per line, it is okay to go over, it may just be smaller to fit it on the glass.